The final weeks of summer are here so cool off your summer skincare regime with cucumbers straight from the garden or your local Farmer’s Market! Below are some tips from beauty expert and owner of As U Wish Nail Spa, Skyy Hadley, on ways you can use cucumbers at home for more than just a salad. 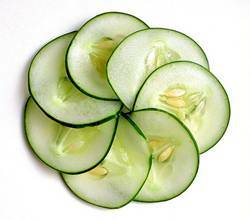 Cucumbers are packed full of water that can help re-hydrate and refresh your skin after hours in the sun or at the beach. You can create your own cucumber toner at home by mixing ½ a cucumber and 3 tablespoons of witch hazel in a blender until smooth and then pat onto your face using a cotton ball. Feel refreshed instantly! Relax your feet with a cooling cucumber foot soak after a long day at the theme park or summer fair. Mix 2 cups of Epsom Salt into a warm water bath add slices from one cucumber and soak your feet for about 5-10 minutes to help reduce inflammation and swelling. Keep your feet elevated after the soak for best results. Visit Skyy Hadley at her As U Wish Nail Spa this month and ask for her exclusive pampering Cucumber Peel Heel Pedicure!